Th-INK-ing of You: May 1 Release Blog Hop! May 1 Release Blog Hop! Hello friends! Welcome to the May Release Blog Hop! Here in the US, May flowers are in full bloom, and the earth is singing the praises of it's Creator! We hope you are too! There will be THREE prizes: a $20.00, $30.00, and $40.00 Gift Certificate toward stamps in the ODBD Store. *Must be redeemed within the month of May! To qualify to win all you have to do is hop to each designer's blog, leave a comment, and return to the ODBD Blog to tell us you completed the hop, and if you had any difficulties along the way! Easy Peasy!!! Our hop this month focuses on two different themes. I think you'll find lots of different possibilities with these two themes! For my samples, I have decided to share one of each. First, I created a special masculine "gift" card... a card that actually houses a little box that holds a fishing lure. Depending on the requests I get I may do a tutorial for this card later on... but for now, here is my "gift card". 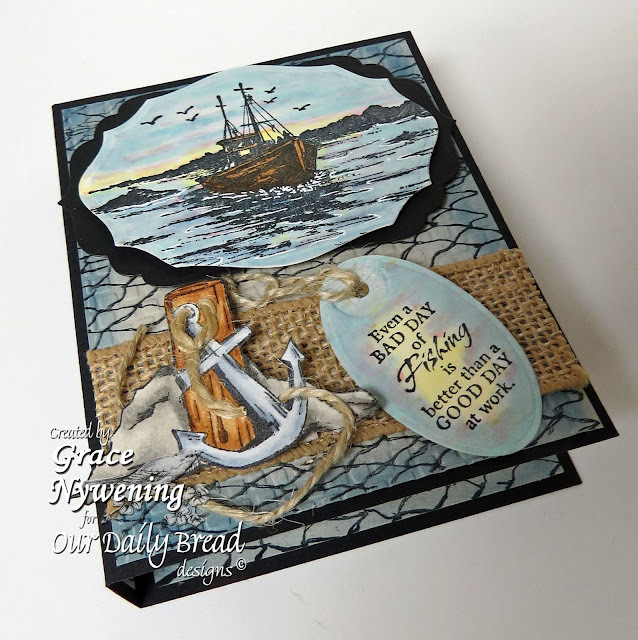 For this card, I used Waves on the Sea, Fishing, and Fishing Net Background, as well as the anchor image from a past release, Anchor. I cut my image panel with the ODBD Custom Elegant Ovals Die, and matted with Spellbinders Labels 4 in black. The image itself is colored with Copics. 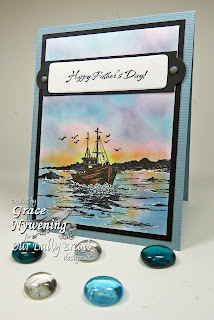 I stamped the sentiment from the Fishing set, and cut it with a Spellbinders Back to Basics Tag die. I added some burlap, twine around the anchor, and I knotted some twine for the tag. The tag is colored with Copics as well. The card itself looks more like a book from outside, because there is a surprise inside. I created a custom sized "box" to hold a fishing lure as a gift for my husband, who loves to fish. 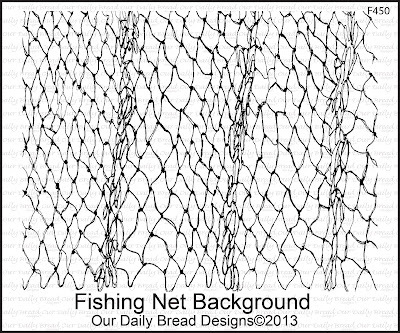 The inside of the card is stamped with the Fishing Net Background on River Rock, and then lightly spritzed around the edges with my Airgun, using a B91 Copic Marker. 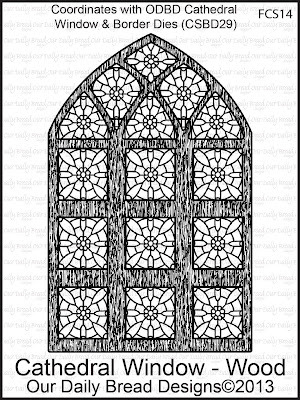 My second sample is much more formal and uses the Cathedral Window Wood stamp, and the ODBD Custom Cathedral Window and Border Die. For this card, I wanted to create a wedding card, and I decided to try to create the feel of a wedding chapel. 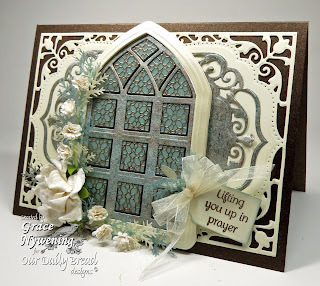 I stamped the Cathedral Window Wood with VersaMark and heat embossed on vellum using a midieval metals embossing powder. (It is basically copper colored). I lightly colored the back of the vellum with blue and violet Copic Markers and my airgun, but it's hard to see the color in the photo. 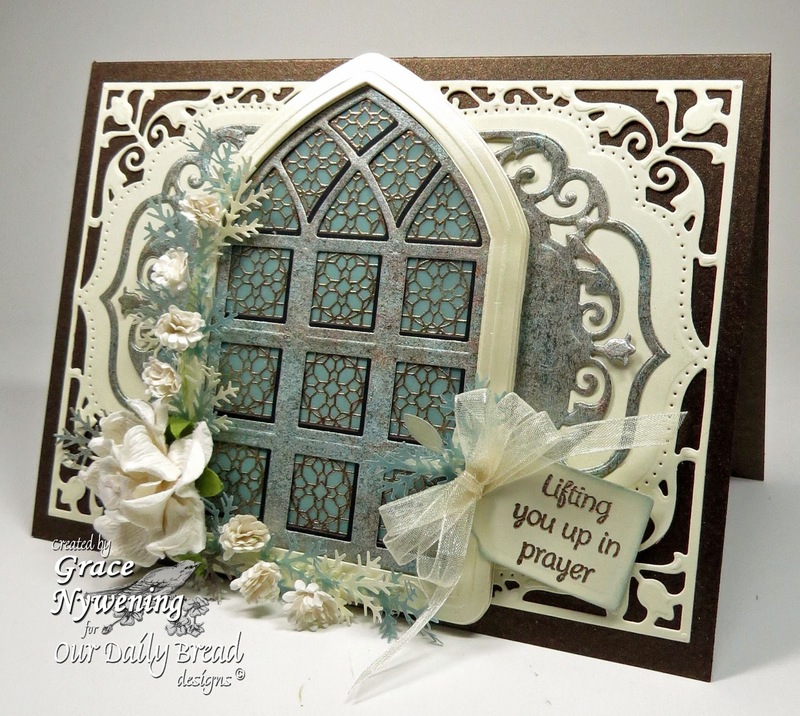 I then cut the window with the Custom Cathedral Window and Border Die from both vanilla and Prism Antique Bronze card stock. I used the bronze window pane cut to give a little shadow to my panes, and then adhered the vanilla window pane over top, offsetting just a little bit. I adhered my window on to a vanilla base which I had cut with my new Spellbinders 5 x 7 Elegant Labels 4 die. As you know, you can't get a top fold from standard card stock when working with this large a die, so I had to create a hinge by scoring the top fold, and cutting part of the design a second time. I then matted my card front on that partial cut, and backed it with still another die cut. This completely hides the hinge and allows a top fold card even when 12 x 12 card stock isn't long enough. My sentiment is from a past release, All Occasion Sentiments, and it is cut with Spellbinders Fancy Tags 1. I added some Cheery Lynn mini Fanciful Flourishes and little flowers punched with a CarlCraft punch. The greenery is punched with a Martha Stewart bough punch, and I added tiny pearls to the centers of the flowers. 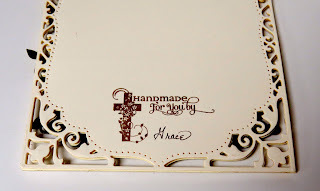 To add to the fun I stamped the Flourished Cross Samped by Mini on the back and signed it. I'm so excited that ODBD is now offering these special little stamps!!! From here, you will hop to the super talented Julie! Grace...I'm in awe at your creativity!!! Pure genius! Your samples are just fabulous!!! 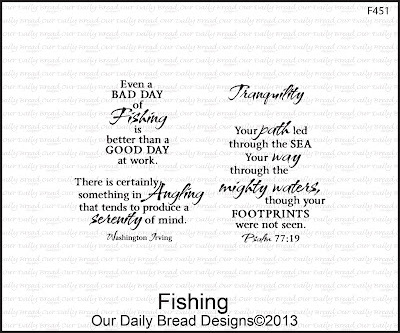 Beautiful wedding card and great way to give a fishing lure. Wow Grace!! Stunning!! I just love your wedding card and the backgrounds in the background and the little surprise inside your fishing themed card!! You are such an inspiration my friend!! Amazing! Wow! I really like the fishing card, especially the gift box concept! Grace, your box and cards are FABULOUS! You are so talented! These are just stunning Grace, Love this window and the embossing. Both are just wonderful! Thanks for sharing! Grace both of your cards are just beautiful! I love the way you put your cards together. So much talent! Love the fishing card, and the awesome gift box idea with fishing lure. You are so very talented! Love your playlist music selection as well! How cool is that box? What an awesome idea...I love everything about it! And your card is really beautiful...great dimension and textures too! I am always in awe of your creativity, Grace! Both projects are stunning. Your wedding card is pure elegance! Hugs! Grace these are both so amazing! The gift box is absolutely fantastic! What a great and fun way to give the fishing lure to your hubby! I know he will be so excited! And the wedding card is breath taking Grace!!! It is so gorgeous I just can't stop looking at it! Wow, Grace! I'm speechless! Your cards are breathtaking! I need to get some masculine cards made, and some for sympathy, which these stamps would be perfect for! Gorgeous as usual Grace! 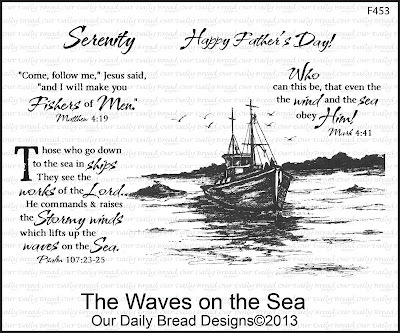 I love the boat scene and especially the new fishing net background stamp. the cathedral window scene is so elegant. Amazing Grace does it again! Beautiful cards, and I am flipping out about the lure gift card idea. Oh my goodness, these are fantastic!! I love the gift card holder. Please do share a tutorial on that!!!!! :-) This is one awesome masculine card. You did capture the feel of a wedding chapel. Love this card too! Wow! These are all fabulous, Grace! 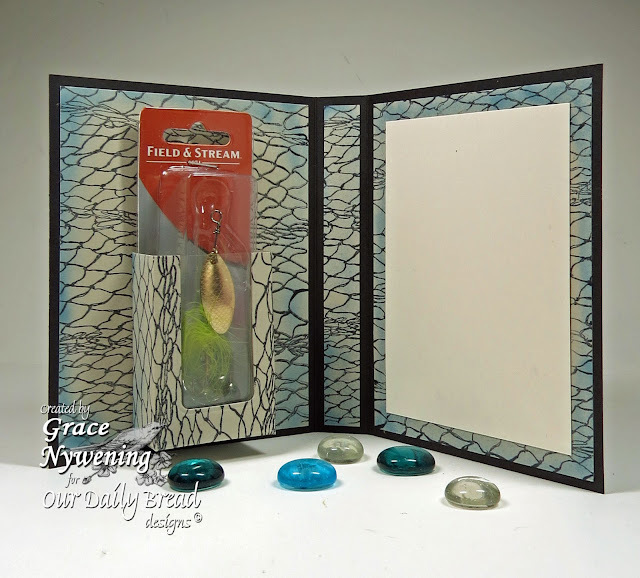 Your fishing box is perfect for that special fisherman and your cathedral window card is fantastic. So much beauty and detail. Incredible cards! Love the fishing card! So creative! Your gift box card is wonderful! Love the elegance of your wedding card! As always, gorgeous colors on both! 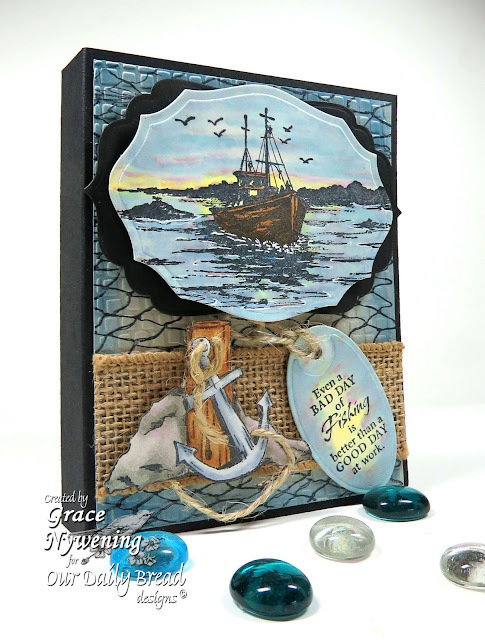 Oh my Grace they are both just Beautiful, the first is such a great masculine design, love the twine and burlap and the combo of the stamp sets, it all came together wonderfully!! 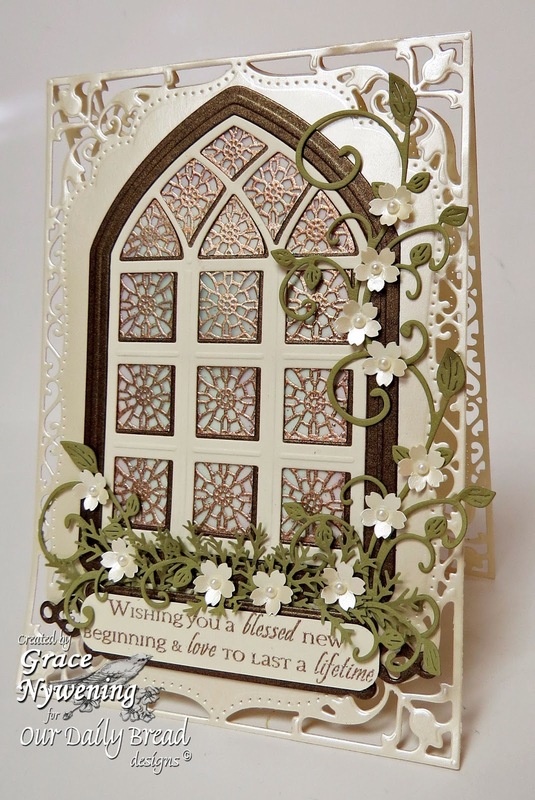 Your wedding card is Gorgeous, love that framing and such great details to the window!! Love both of your cards.........each so unique! I can see a lure in my hubbie's for Father's Day! Thanks for sharing your talent! Gorgeous new release. I love the fishing boat. These are all very beautiful creations. I love all these cards! The burlap and twine make the first card so masculine, and the gift box idea is so clever. The wedding card is absolutely stunning! Thanks so much for the wonderful inspiration. It is often so hard to find a good masculine design! You aced it! Lovely gift box. I love these. I have a brother-in-law that would love that fishing lure card! Grace, every card shown is amazing. Your coloring is so beautiful!! Your cards are so fabulous. The details, colors, layouts - everything. Just love your talent displayed. What fabulous cards! I love what you've done with these stamps and dies. You have such talent! Fantastic - as per usual. Love both of them. Both are beautiful pieces of art...true masterpieces!!!!! Great projects. The card is beautiful. Grace, Both cards are beautiful. I love that church window and the masculine boat. I think it is much easier to make feminine cards, and you nailed it making the masculine one. Thanks so much for sharing your creativity. Grace, both projects have such "wow factor". Know your hubby will love the way you packaged the lure in the beautifully textured and colored card. The cathedral window is just breath-taking...love the elegance! Grace I love your masculine card that is just plain AWESOME!!!! So beautiful Grace. I love your designs. Absolutely gorgeous cards!! I love the wedding card. Great idea for the fishing lure gift! Beautiful examples! WOW!! Your card box and card are absolutely G.O.R.G.E.O.U.S!!!!! love them and the new stamps are awesome!! Oh, my goodness. What gorgeous cards. You did a great job. Amazing cards! The wedding card is absolutely GORGEOUS! Wow, wow, wow, Grace! What beautiful cards! Your husband is going to love his! Thanks for explaining how you made both cards. Wowie! Absolutely gorgeous cards...love them both. The intricate details you put so much love into. Your work is amazing. You are such an inspiration. I absolutely LOVE the fishing card with the amazing box holder for a lure! What a fabulous idea. My husband is a fisherman and this will be great for him and his fishing buddies! Love the cathedral card as well. You are always such an inspiration! Thanks for sharing with us!!! Such creativity across the board - a wonderful masculine card and an elegant wedding beauty! Love all the details on both - especially the matching sponging on the tag and the embossed gold on the window. Hugs! Wonderful cards Grace! Love the gift box card! Your wedding card is gorgeous! TFS God bless!! I love the box concept and theme of fishing card. May I borrow the idea, for my husband's birthday gift card packaging.Thank you for inspiration. Those are both amazing cards. The cathedral window is spectacular, but with my love for the sea I think the first one is just wonderful. Grace, you are an awesome designer. ALL your cards are stunning. The card for your husband is lovely, and the wedding card is so gorgeous. Love, love, love the colors. Oh Wow Grace...Your cards are STUNNING...Wow...you rock girl!! Amazing love the stamp set and the blending of the colors. thanks for sharing. Amazing projects! Love the beautiful window you created! Your card really does have the feel of a wedding chapel! Thanks for sharing all the details! Wow, both of these are amazing! I would love a tutorial on the box card. Very pretty cards! 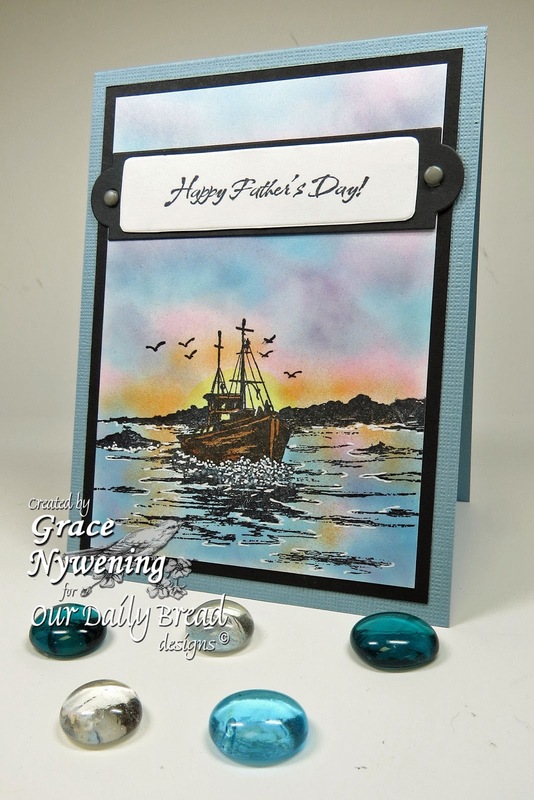 Love the fishing boat stamps, would be great for my husband :) Still snow & frozen ground in my part of the US, now flowers yet! 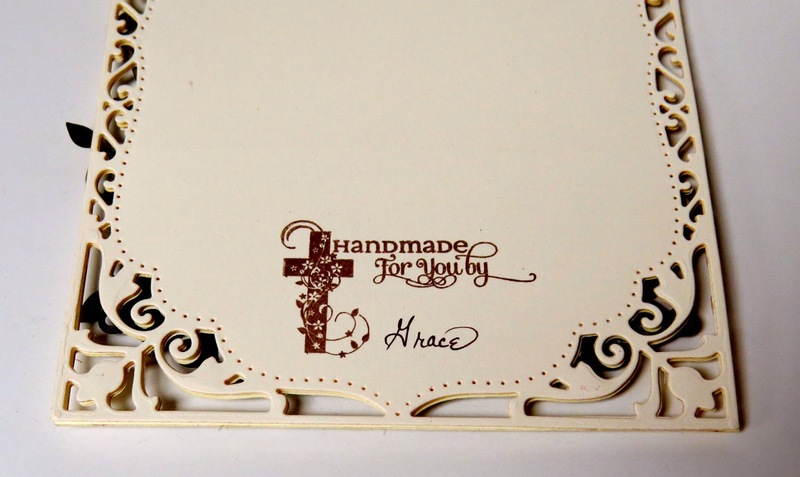 Fabulous projects Grace - love the lure box! With Love and Flower Soft! Shedding some Light and a mini tutorial! 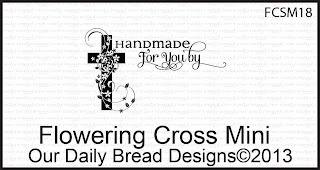 Christmas Blessings in May, and free shipping!